I tore myself away from the Olympics earlier this week to watch Mervyn King announce that the Economy currently has no pulse. He also suggested that though there will be jam tomorrow, he doesn't know when exactly it will arrive and warned us not to expect too much of it. Reading that the UK trade deficit had hit a new record, I wondered how much worse it has to get before you cut back on cutting back. 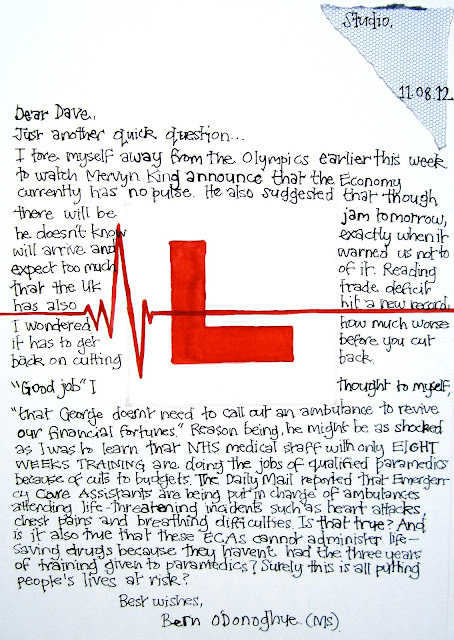 "Good job" I thought to myself, "that George doesn't need to call out an ambulance to revive our financial fortunes. Reason being, he might be as shocked as I was to learn that NHS medical staff with only EIGHT WEEKS TRAINING are doing the jobs of qualified paramedics because of cuts to budgets. The Daily Mail reported that Emergency Care Assistants are being put in charge of ambulances attending life-threatening incidents such as heart attacks, chest pains and breathing difficulties. Is that true? And is it also true that these ECAs cannot administer life-saving drugs because they haven't had the three years of training given to paramedics? Surely this is all putting people's lives at risk?